The genus Chamaenerion is often spelled Chamerion. Montane, subalpine. Openings, disturbed areas. Summer, fall. Sharkstooth Trail, September 29, 2014. Above: Colorado Trail, August 20, 2017 and September 6, 2017. Left: Roaring Fork Road, July 26, 2004. 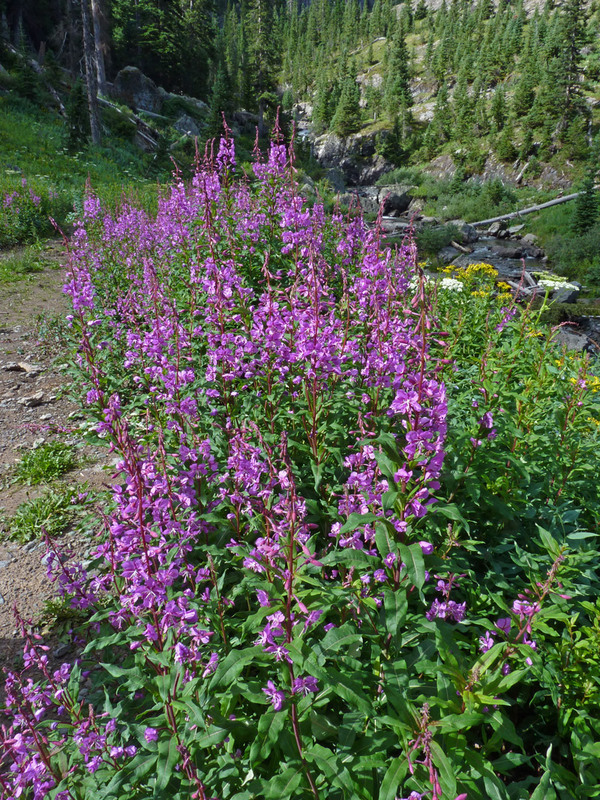 Fireweed is one of the most visible of montane wildflowers, often lining roads and filling in large fire-scarred areas in mid-to-late summer and even into fall. Lowest flower buds open first and the plant continues to bud and flower, growing taller and taller. 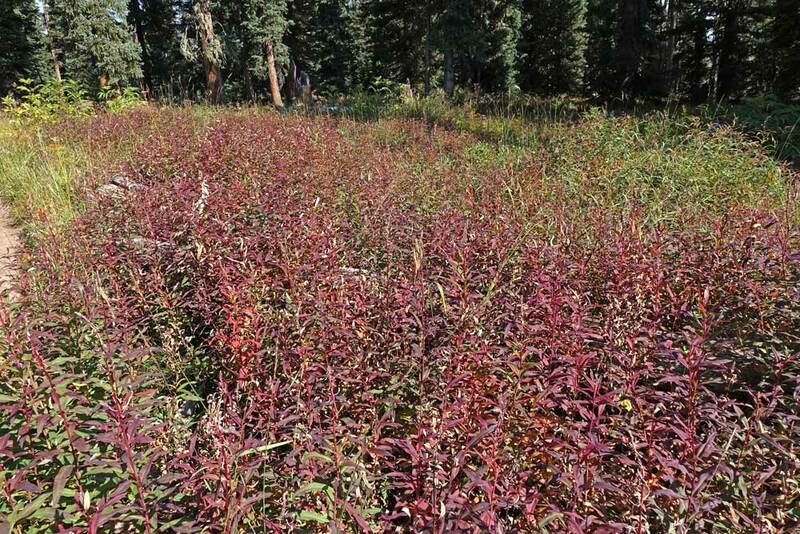 It commonly reaches three feet and it spreads into thick patches from underground roots. 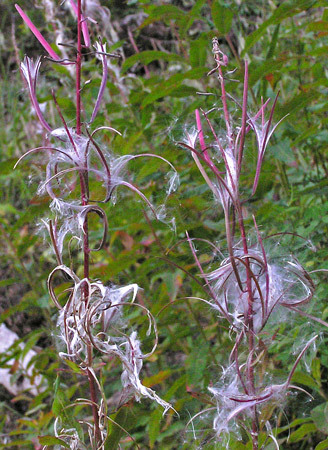 Like the Epilobiums (to which genus it is still assigned by some botanists), Chamaenerion angustifolium has long seed pods that ripen and burst open with very visible cotton-covered seeds. 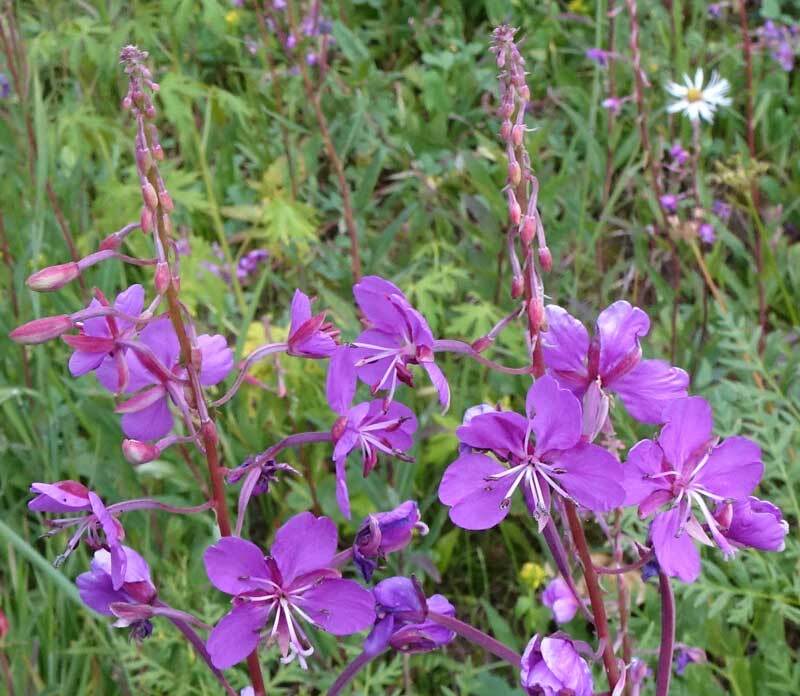 Although Chamaenerion angustifolium does put on a magnificent flower show, that show can end very quickly. 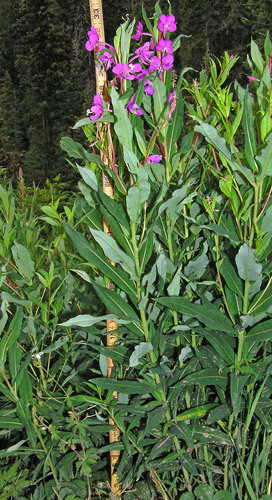 The second photograph above shows the same patch of plants as the top photograph just two weeks later. 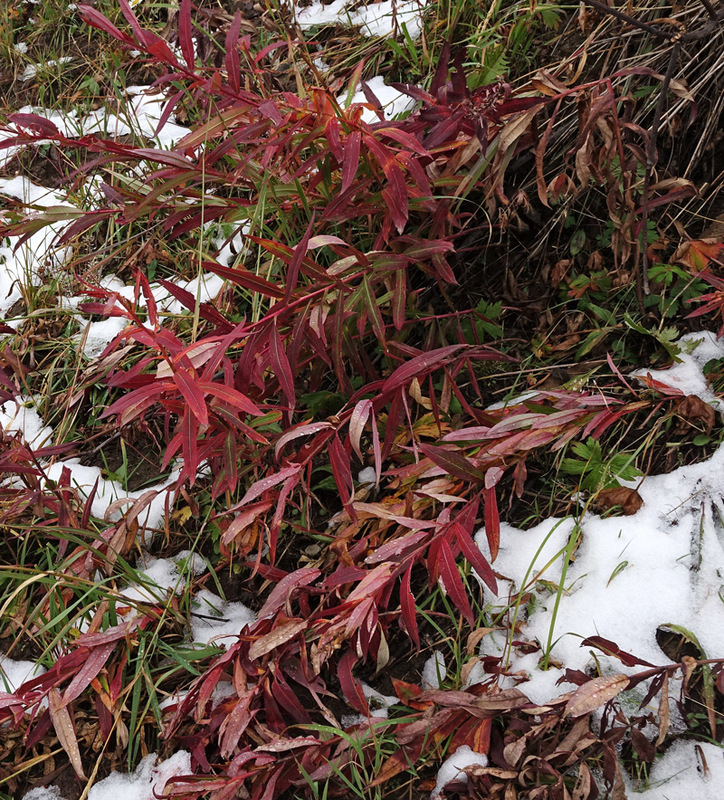 Not only has flowering ended, but now the leaves are deep into autumnal colors. 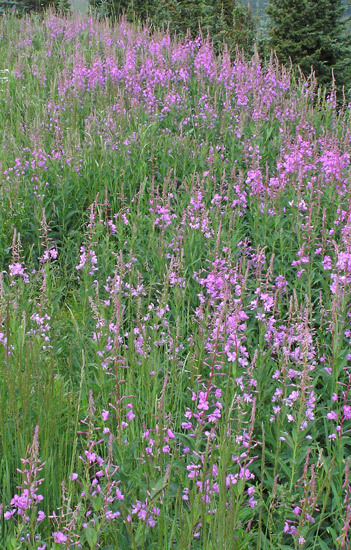 Linnaeus named this species Epilobium angustifolia in 1753. Constantine Rafinesque named a new genus "Chamerion" in 1833, but it was not until 1972 that the species pictured at left was placed in this genus by Joseph Holub as Chamerion angustifolium and then as Chamerion danielsii in 1981 by Doris Löve. The latter name is accepted only by Weber. 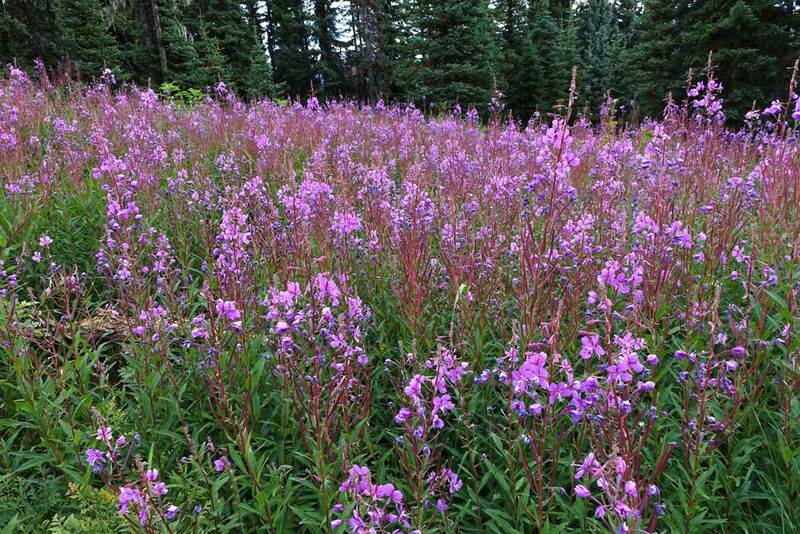 The former name is accepted by most botanists, but almost all floras agree with this statement from Intermountain Flora: Chamerion is "an arbitrarily shortened derivative of Chamaenerion, a pre-Linnean epithet of Epilobium angustifolium meaning dwarf oleander". 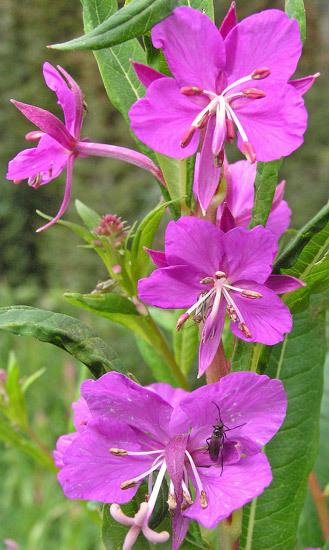 Alexander Sennikov's 2011 Taxon article, "Chamerion or Chamaenerion (Onagraceae)? The Old Story in New Words" traces the treatments and name changes for the species and concludes that "the correct generic name [is] Chamaenerion. 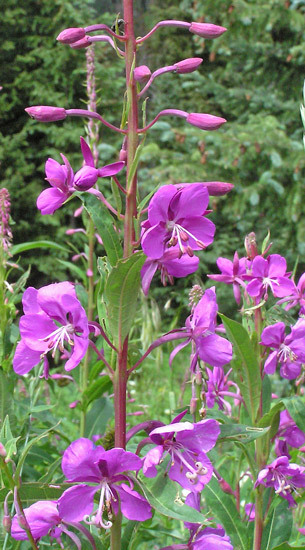 "Chamaenerion" is from the Greek "chamae" ("lowly") and "nerium" ("Oleander"). Roaring Fork Road, July 26, 2004. 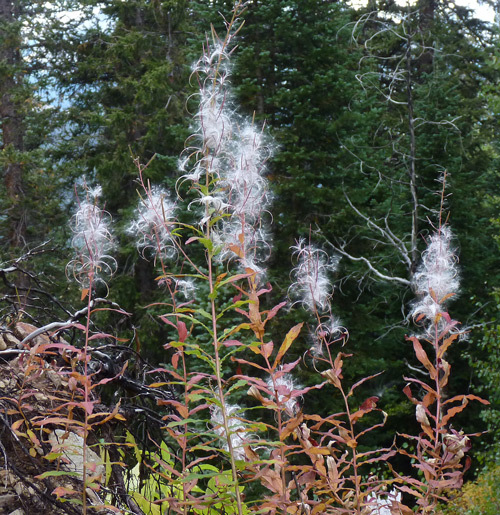 Lake Hope Trail, September 20, 2011. .
Long, narrow seed pods explode in a fluff of white. Navajo Lake Trail, August 30, 2007. 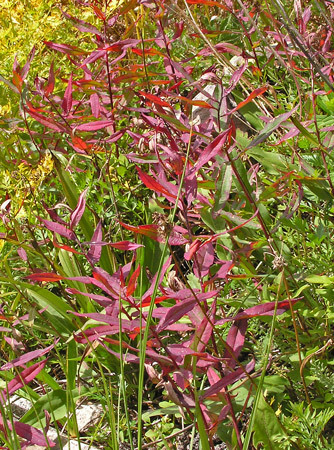 Fall color attracts almost as much attention as summer flowers.